2 editions of Life of Right Rev. John N. Neumann, D.D., of the Congregatio... found in the catalog. Add another edition? Are you sure you want to remove Life of Right Rev. John N. Neumann, D.D., of the Congregation of the Most Holy Redeemer. Fourth bishop of Philadelphia. from your list? Life of Right Rev. 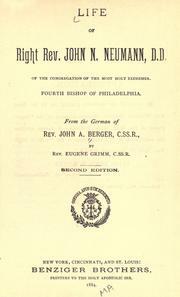 John N. Neumann, D.D., of the Congregation of the Most Holy Redeemer. 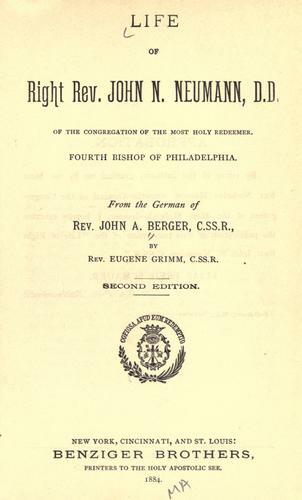 Fourth bishop of Philadelphia. Published 1884 by Benziger Brothers in New York .